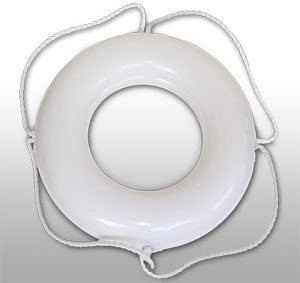 Our U.S. Coast Guard-Approved 24" Buoy is made of unicell solid closed-cell foam. This ring buoy is soft, resilient, resists temperature and weather extremes and is nearly indestructible. 24" commercial quality ring buoy is made of Unicell solid closed-cell foam - soft and resilient to the touch yet almost indestructible. This is considered an oversized item. To minimize shipping cost we recommend buying more than one buoy at a time. Buoys are packed in cases of 6.